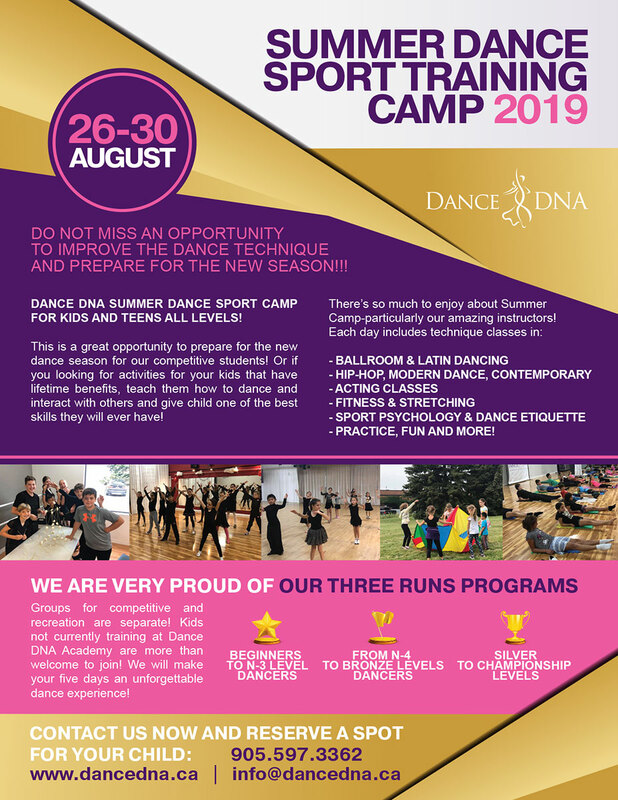 Dance DNA Sport Training Camp for kids and teens all levels! This is a great opportunity to prepare for the new dance season for our competitive students! Or if you looking for activities for your kids that have lifetime benefits, teach them how to dance and interact with others and give child one of the best skills they will ever have! There’s so much to enjoy about Summer Camp-particularly our amazing instructors! 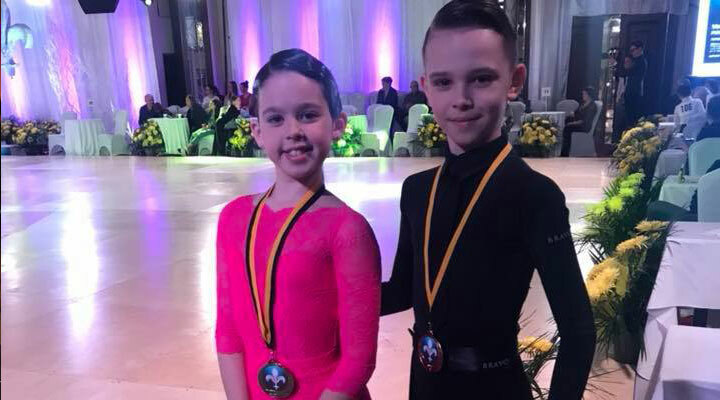 Each day includes technique classes in Ballroom & Latin Dancing, Hip-hop, Modern Dance, Contemporary, Acting Classes, Fitness & Stretching, Sport Psychology, Dance Etiquette, Practice, fun and more! Groups for competitive and recreation are separate! Kids not currently training at Dance DNA Academy are more than welcome to join! We will make your five days an unforgettable dance experience! Call now and reserve a spot for your child! Daily non-competitive ballroom dance classes are taught by our qualified dance instructors inside of our facility. Dance in Motion Class. Daily recreational and fun dance classes including elements from Hip Hop, Jazz, Modern styles and Ballroom dance styles. Fun, creative, and age appropriate Arts & Crafts activities are provided each day. The Arts & Crafts selected promote self expression, and provide an opportunity for creativity. Outdoor activities will be scheduled daily, weather permitting. These activities will include outdoor lunch, outdoor games, etc. Dance DNA will be utilizing outdoor facilities such as Leparc Park. Campers must bring a labeled hat, sunscreen. Campers must be dressed comfortably for dance and have indoor running shoes. Long hair must be tied off the face during dance classes. Jewelery is not permitted in the dance classes. Campers must bring labeled sunscreen and hat daily for outdoor activities. Please keep all valuables at home. Dance DNA is not responsible for lost or stolen items. Full payment is due at the registration. No post dated cheques. Cheque, cash or credit cards only. No refund once session is started. Campers must be picked up promptly at 5 pm daily. Late pick-ups will be subject to extended hours fee. Intensive week program for dedicated students of all levels and ages to jump up in their dance skills. If you are beginner or a part-time competitor and would like to advance your dance level this program is for you! Intensive week program is an individual program that can be scheduled on a private or semi-private basis only. This program is available during the summer time or school breaks only. Choose one or more weeks to improve your-self! Program incorporates 1-3 hours a day (for kids 8-10y.o.) and may be 1-5 hours a day (for kids 11-19y.o.) and includes Latin and Standard technique. This program will focus on enhancing of student competitive routines as well as improvement musicality, self-expression and physical condition. Intensive week may include private or semi-private lessons, self practices, supervised competitive finals, stretch and strength classes. Spaces are upon the availability and by request only, ask your teacher for detailes.